THANK YOU SHELLEY!!!! Your granola recipe was EXCELLENT!! I feel like I should send you a prize or something for this recipe! After dinner was over and the kitchen was cleaned, I pulled out my ingredients and started my final attempt at homemade granola. I had hope, but I kept that hope stuffed deep down inside in case things didn’t work out. This was my last chance at homemade happiness. My son came into the kitchen and watched me without saying a word. I looked at him and said “third time’s a charm” and he nodded knowingly and walked out (he’s the strong, silent type). Then my daughter Sarah came in and started peppering me with questions “You’re making granola AGAIN? What’s in this one? How is this different from the last times? Why did you burn the last one?” and on and on and on (she is the polar opposite of her brother). I told her that I was going to give it one more shot, because I believe in granola. She stole a couple of almonds and happily skipped out of the kitchen. I mixed it all up, put it in the oven, set the timer and then went to fold some clothes in the laundry room, which has a direct line of sight to my oven. I watched for smoke. I sniffed the air for that too-familiar odor of burning bread. So far, all was well. 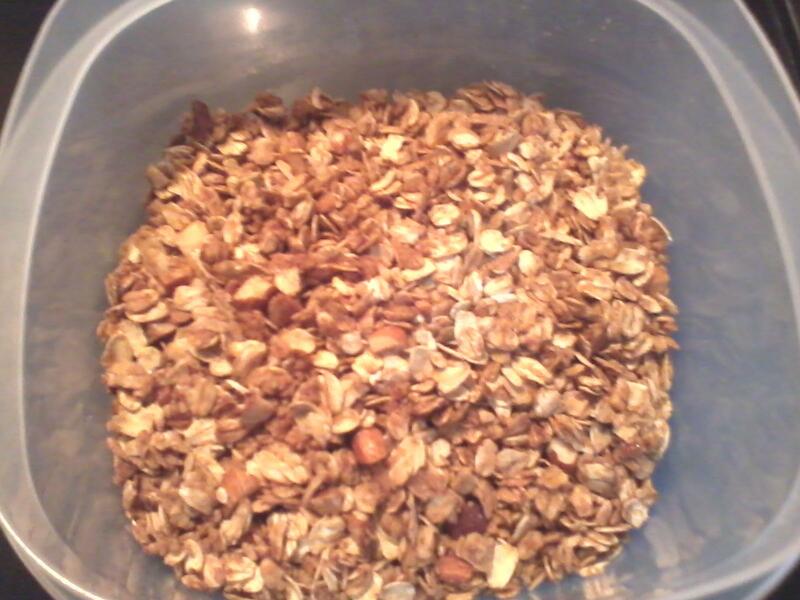 After 15 minutes, the timer dinged, and I IMMEDIATELY stirred the granola – so far so good. I set the timer for another 10 minutes, finished folding the clothes in the laundry room and was giddy with anticipation. The timer dinged again and I IMMEDIATELY got the pan out of the oven, gave it another stir, and then couldn’t decide if I should put in a for a couple more minutes or if I should just let it sit and hope it would get crisp – I decided to go against my instinct of cooking it longer, so I just let it sit where it magically and perfectly crisped up to granola standard. That was it! I was done! I finally got that cinnamon-y scent wafting through my kitchen, not a burnt toast odor to be found anywhere! The only changes I made were that I left out the coconut (I didn’t have any on hand, but will add it next time) and I had to swap almonds for the pecans, but other than that I stuck to the recipe as written. I foresee myself making this stuff at least once a week from now until I die. This post made me smile so big!! Congrats – very happy it worked for you!!! You might know this, but I didn’t until a couple months ago – most coconut is covered with sugar (kind in bake aisle at grocery store). Plain coconut is available in food coop type stores. I guess I should have specified unsweetened coconut – and I buy the “chips” that are in our more natural section of the store. It says unsweetened coconut in the recipe. I think I’ve seen unsweetened coconut at my local grocery store, so I can get it pretty easy. I’m not a huge fan of coconut, but I’m starting to like it a little bit. Oh I’m so happy that you had success with this recipe!! That smell is heavenly, isn’t it? And its fun to vary the nuts and fruit you add. Sometimes I add sunflower seeds and pumpkin seeds. darlin’ it is time for a new post, I think ‘cookies’ every time I see the bowl. . .